Following critical acclaim and announcing an extension in the West End, the Chichester Festival Theatre revival of Guys and Dolls will tour throughout the UK, opening at the Liverpool Empire on 16 March 2016. Casting for the tour includes Richard Fleeshman (Coronation Street, Ghost the Musical, Call the Midwife) as Sky Masterson, Maxwell Caulfield (Grease 2, Emmerdale, The Colbys) as Nathan Detroit, Louise Dearman (Wicked, Evita) as Adelaide and Anna O’Byrne (Love Never Dies) as Sarah Brown. The show is coming to the Edinburgh Playhouse from Tuesday 12th to Saturday 16th April and the King’s Theatre Glasgow from Tuesday 7 until Saturday 11 June 2016. Louise Dearman (Wicked, Evita) will play Adelaide at all venues up until and including Bord Gáis Energy Theatre, Dublin. Further casting for the King’s Theatre Glasgow will be announced in due course. Completing the cast are Jack Edwards as Nicely Nicely Johnson, Peter Harding as Arvide Abernathy, Anthony McGill as Lt Brannigan, Mark Sangster as Benny Southstreet, Melanie Marshall as General Cartwright, Craig Pinder as Harry the Horse/Joey Biltmore, Cameron Johnson as Big Julie, Christopher Howell as Rusty Charlie. The ensemble includesEamonn Cox, Jamal Crawford, Jonny Godbold, Ross Lee Fowkes, Aron Wild, Kiel Payton, Matthew Whennell-Clark,Ruthie Stephens, Bethany Linsdell, Hannah Cauchi, Chloe Chambers, Danielle Stephen, Abigayle Honeywill andLucy Ashenden. Nathan Detroit is desperate: he needs money for an illegal dice game, and he needs it fast. Not to mention a 14-year engagement with nightclub singer Miss Adelaide, whose patience is finally running out. Enter notorious gambler Sky Masterson, a guy who can never turn down a bet, and straight-laced missionary Sarah Brown, a doll with a heart of ice. Nathan’s wager is that Sky has to romance Sarah by taking her to Havana for dinner and in return he’ll provide a dozen ‘sinners’ for Sarah’s mission. Surely this is one bet Nathan absolutely can't lose? A joyous and vibrant celebration of Prohibition-era New York, Guys and Dolls first premiered on Broadway in 1950 and captured the optimism and energy of post-World War Two America. 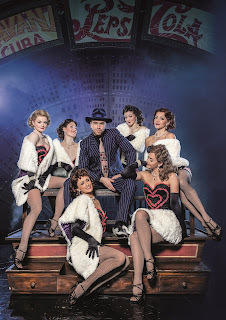 This hugely popular and multi award-winning musical, based on the colourful stories by American journalist Damon Runyon renowned for his vivid fictional depictions of the gamblers, hustlers and nightclub singers of New York, features some of Broadway’s greatest musical numbers including ‘My Time of Day’, ‘Luck be a Lady’ and the show-stopping ‘Sit Down You're Rockin' the Boat’. Guys and Dolls is directed by Gordon Greenberg with choreography by Cuban dancer and former Royal Ballet star Carlos Acosta and Andrew Wright whose credits include Chichester Festival Theatre’s Singin’ in the Rain.